But, just like everybody else, this summer's new "it" color, Chanel Mimosa, instantly sparked my interest, even more so that very little info was available as to color accuracy, release date, etc. 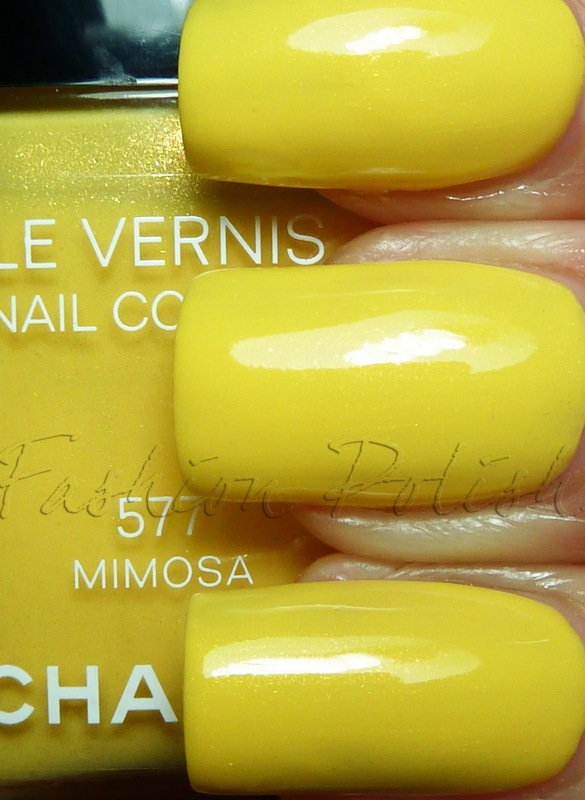 ﻿As soon as I heard about Mimosa, I wanted to know how it would compare to Chanel's other bright yellow from the Robertson collection : L.A. Sunrise and today I can say that they are really close. Mimosa's shimmer particles seem to be evenly parted between yellow, orange and green while L.A. Sunrise's strong silver flash tends to outshine those same shades. 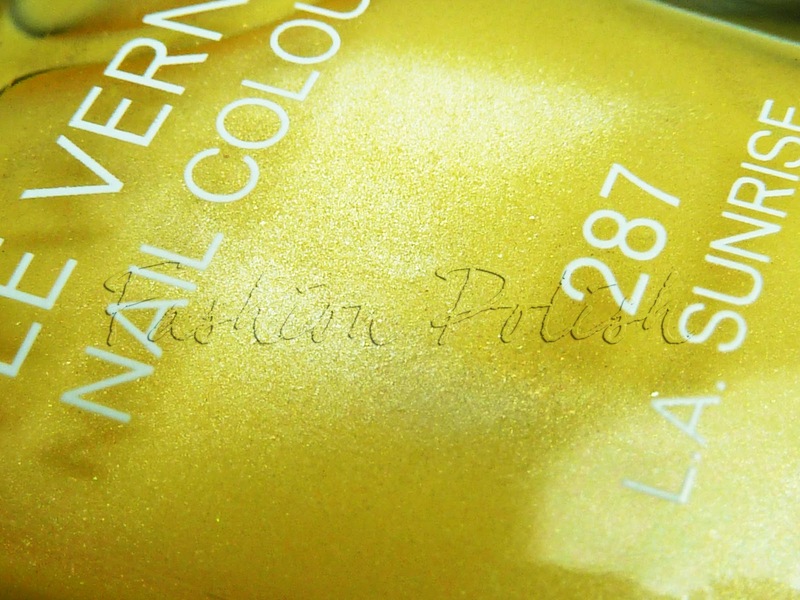 L.A. Sunrise's shimmer is much thinner and abundant too, the overall effect being of a slightly lighter yellow. In term of appliation, they're pretty much the same : very nice 2 coaters, surprisingly good for yellows. 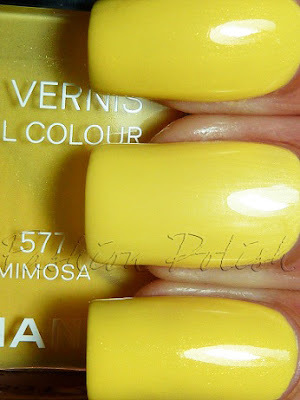 Now, if you like yellows and haven't been able to get L.A. Sunrise, definitely grab Mimosa! It's my favorite from those two and it's a fresh, bright and funny color to wear. when is it being released? im not a huge fan of yellow but this looks stunning! @Hey-Hay I really have no idea, maybe sometime in april or may??? How in the world do you get NP before anyone else?! It's crazy, haha. I didn't like this polish a lot. I guess I prefer ocher and gold when it comes to yellow. They are both so pretty, but I don't think it is worth having them both. Oh my goodness what an amazing color. Can't wait to get my hands on this one! Hi girls, I really like Mimosa too! 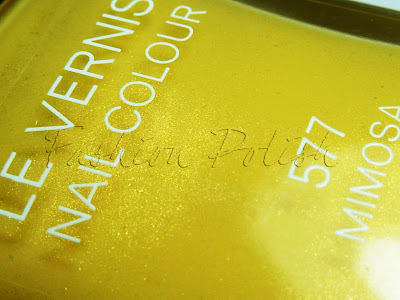 I'm not so much into yellow nail polishes but this one cheers me up. @Sarah I have a lot of swatches I've been postponing because I've desperately lacked blogging time lately but I'll try and think about something for you! @Une Ruxi � Paris Indeed, they look very much alike and my pick is Mimosa. @Ana Patricia Weel, I do have a sort of gold polish up and ready for tomorrow's post so I hope you'll like that one better. Ooh, love this! Thanks for the swatch! I love yellows, and this one is special! I want it!!! Wow. You know, I really don't like yellows .. but I totally dig this one! Maybe because of the shimmer, it looks fantastic! Oh wow... 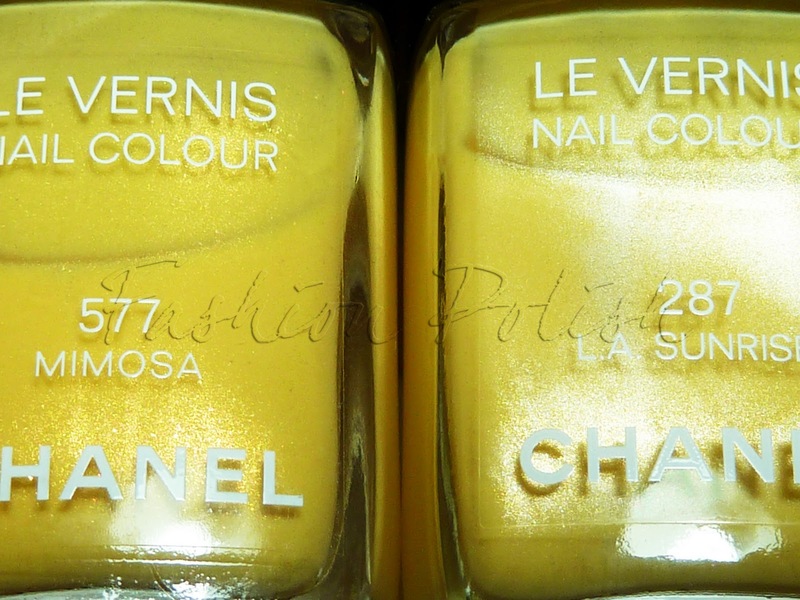 I've never saw a Chanel polish I felt I NEEDED but I feel that I need this. It's such a happy color, it instantly lifts up my spirit. I can't wait for summer to come now! Adore it... that's a yellow I definitely need. Makes me wish it was summer already. Thanks for swatching! I heard the release in The Netherlands will be somewhere in April, o why do we have to wait that long!! 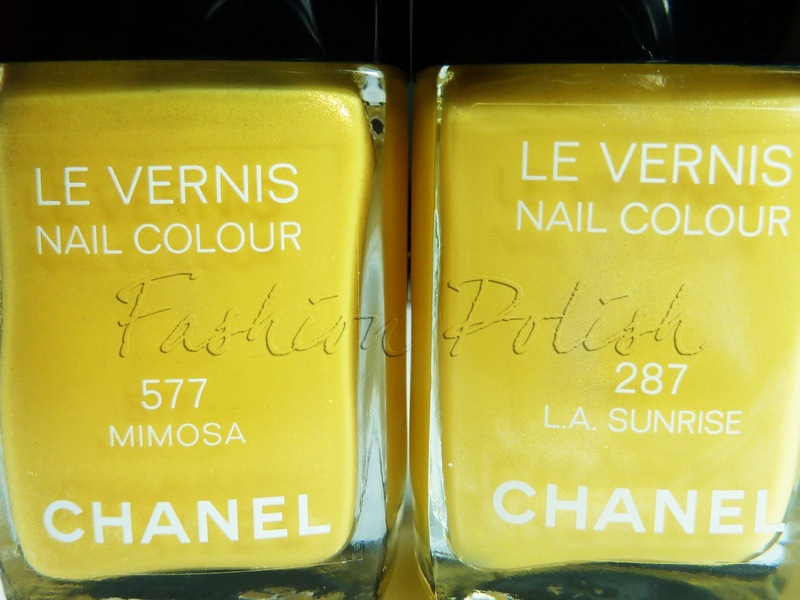 This is really a stunning color and we just love the nail polishes from Chanel, can't wait! Let the summer begin! Congratulations with such a blog and keep those nails polished! I guess you will want to get a facebook icon to your blog. Just marked down the url, however I must complete it manually. Just my advice. i love, love, love this color! however, I'm very pale (blonde, freckles, basically no tan except for a little shimmer), so I don't know if yellow is the best color for me. I heard that this one even works on pale people - what do you think? I would really like to hear your opinion. @Anonymous I believe Mimosa should work on a pale skin tone, it's very bright and doesn't lean to green or orange... But if you've worn any yellow, it does take some getting used to. thanks for the quick response! It does make sense what you're saying. But I think I'm not going to take the risk (Chanel's not the cheapest after all) and probably get Morning Rose instead...! @Anonymous aahhh you can't go wrong with Morning Rose!!! You know, I always prided myself on having a really strong colour sense, but I admit it: I'm looking & looking at those three nails and I can't tell the difference! If you told me LA sunrise was the top, or the bottom.. anyway I'm fascinated by what Peter Phillips is doing: it's just NAIL POLISH, and yet it becomes so much more. I keep thinking how to explain this to someone recently arrived from another planet. Great blog btw.